Monday, Aug. 13, The Outland Ballroom in Springfield, Missouri, played host for the Hot Summer Nights Tour starring the Butcher Babies with special guest Hyro the Hero and Tetrarch. Kicking off the night with stunning exuberance and led by Texas-born Hyro himself was Hyro the Hero, a L.A.-based rap/metal band. With Dave Orton (of Gina and the Eastern Block fame) on guitars matching the energy and excitement of Hyro, they made for a powerful performance. While their excitement might have led to a bit of a rocky start, they soon found their rhythm and matched the energy from the crowd they were creating. Not to be outdone, the drummer and bass player brought their best with equal energy and sick beats. Hyro the Hero, formally known as Hyro da Hero, is a very high energy, explosive sight to see for sure and a great pick for support on this tour. Next up in the Hot Summer Nights line up was Tetrarch out of Atlanta, Georgia, and based in L.A. Tetrarch had to deal with some vocal mic issues through most of their set but their music, a Nu Metalcore-type sound, was enough to compensate. Bringing the beats was drummer Ruben Limas who made a clear effort to enjoy his set and was fun to watch. Joining him with keeping the beat was bass player Ryan Lerner, who had no problem matching the energy of his band mates and had a great sound. On rhythm guitar and vocals was Josh Fore. You could tell from the passion Fore played with and the frustration he felt due to the mic issues that Tetrarch is very important to him. On lead guitar, and the highlight, was the dynamically-talented Ms. Diamond Rowe. There’s no more fitting name for this young lady because she shined in the darkness of the ballroom just like a diamond. Rowe quickly and easily made fans of everyone in the room and was pivotal in bringing to life the heart and sound of the band. “I’ve known her since school and it’s always been our dream to have a rock band,” Fore said as he described how they recognized each other’s talent and passion for bringing their music to the masses at an early age. Having released their debut album “Freak” in September 2017 to great numbers on iTunes’ metal/rock charts and garnering attention from top metal publications, they are doing just that and are a band to keep an eye on. The Hot Summer Nights Tour, on one of its last nights, was a perfect description for what was to come for the Outland Ballroom with headliners The Butcher Babies. An L.A.-based band and friends of Central Mo News, The Butcher Babies have been a force to be reckoned with and recognized since their inception in 2009. They are riding high on the success of their latest release, “Lilith.” As they reach new heights of popularity while branching out with their writing style to show a softer side of metal, the Butcher Babies are a perfect example of a must-see band. If the Buthcer Babies are a polarizing band, it’s because of their two front women and the talent, passion, energy and excitement they show on their albums and in live shows. Whether they are performing in front of thousands at Rocklahoma or on the smaller stage of the Ballroom, Carla Harvey and Heidi Shepherd put every ounce of passion possible into their performance. Harvey and Shepherd are “metal” and are blazing new trails with their dedication and devotion to their music and fans. Kudos to the Butcher Babies team for picking great openers that were able to match their energy and style. 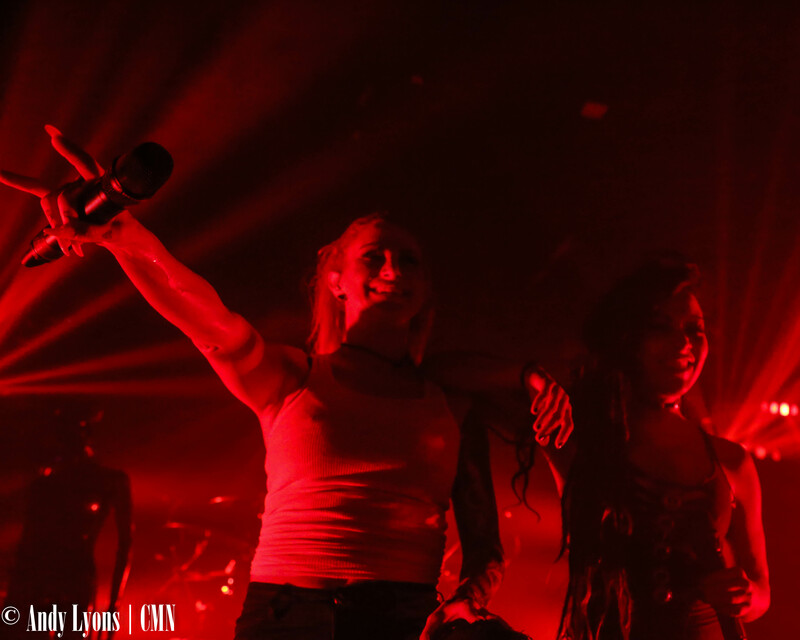 You could tell it wasn’t the heat from the room but the heat put off by the Butcher Babies that made the Hot Summer Nights Tour stop a soul-moving night to remember. The Butcher Babies take a short break before they head to Europe for the Female Metal Voices tour with Kobra and the Lotus.